[INSiDE] THE JAZZ NOTE A TOTAL SUCCESS! Home > Featured > [INSiDE] THE JAZZ NOTE A TOTAL SUCCESS! 20 May [INSiDE] THE JAZZ NOTE A TOTAL SUCCESS! What a fantastic program! This year’s [INSiDE] THE JAZZ NOTE was bigger and better than ever, as it expanded to two action-packed days of music + education: The Inside the Jazz Note Masterclass on Wednesday, May 18, and the 9th Annual Inside the Jazz Note Education Fund Benefit Concert + Conversation on Thursday, May 19. On Thursday evening, the Alexander Kasser Theater at Montclair State University was buzzing with anticipation, as two of today’s leading jazz icons –Wynton Marsalis and Christian McBride– prepared to meet onstage for a candid one-on-one. Wynton Marsalis, an internationally acclaimed musician, composer, bandleader, educator and a leading advocate of American culture, is the managing and artistic director of Jazz at Lincoln Center. Born in New Orleans, Marsalis got his early start in New York (after attending The Juilliard School) with Art Blakey and the Jazz Messengers. He made his recording debut as a leader in 1982, and to date has produced over 80 records which have sold over seven million copies worldwide including three Gold Records, and have earned him nine GRAMMY Awards. In 1983 he became the first and only artist to win both classical and jazz GRAMMY Awards in the same year and repeated this feat in 1984. With the power of his superior musicianship, the infectious sound of his swinging bands and an exhaustive schedule of performances and music workshops, Marsalis has rekindled widespread interest in jazz throughout the world. His embrace of jazz’s long-garnered lineage recognized an older generation of overlooked musicians and inspired a renaissance that attracted a new crop of fine young talent to jazz. It was an honor to have Wynton take the blue seat alongside our esteemed host, Jazz House Kids Artistic Chair Christian McBride, considered one of the most important and prolific figures in the jazz world for the last 25 years. Nate Chinen of The New York Times has described him as, “Among the most accomplished musicians of his generation and increasingly one of the most visible ambassadors.” Earlier this year, McBride received his fifth GRAMMY® Award in the “Best Improvised Jazz Solo” category for his performance on “Cherokee” from his most recent album, Live at the Village Vanguard. He is the first bassist to have ever won that category. After bringing his Christian McBride Big Band to serve as house band for “Smithsonian Salutes Ray Charles: In Performance at the White House”, another big announcement was made: McBride was appointed artistic director of the internationally renowned Newport Jazz Festival, the world’s oldest jazz festival co-created in 1954 by legendary jazz impresario George Wein. Marsalis and Christian McBride have known each other for a long time, but this was the first time they’d sat down like this onstage. The two met in a Philadelphia high school classroom when McBride was 14 years old. A long-time admirer and supporter of McBride and Jazz House Kids, Marsalis was pleased to be part of this year’s benefit, sharing stories with the audience about his illustrious career, star-studded collaborations, and early years. Topping off the evening, Marsalis and McBride played in duo, and shared the stage with the award-winning Jazz House Big Band directed by Julius Tolentino, comprised of 22 exceptionally talented emerging musicians from across New Jersey and considered one of the premier youth big bands in the nation. Earlier this month, the Jazz House Big Band competed in the prestigious Essentially Ellington Competition & Festival, taking home a total of 10 awards. The Dynasty Big Band directed by Mike Lee wowed the audience during a pre-concert performance, while the Blues & Roots ensembles led by Camille Thurman and Josh Evans made guests swing at the lobby. A post-concert reception with the Jazz House Alumni House Band was the perfect ending to a perfect night! Adding momentum to the occasion, Jazz House Kids, Christian McBride, and President & Founder Melissa Walker, along with their supporters, launched the new Jazz House Kids’ Music + Education Fund, which raises much needed funds to close the gap in access to music education in schools and communities across New Jersey. The evening also included a special awards ceremony! 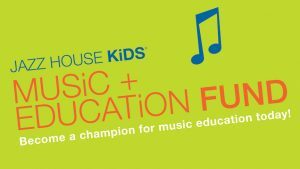 Congrats to Jazz House student Andrew Wagner on becoming the recipient of the Second Annual James Moody Jazz Scholarship for New Jersey, presented by Linda Moody and Jazz House Kids, and administered by the Community Foundation of New Jersey, with a new instrument donated by RS Berkeley Musical Instruments. We also congratulate students Rayner Perez and Xavier Kuzin, recipients of the Musician of Distinction Award, presented by Jazz House Kids and RS Berkeley Musical Instruments. Well deserved! 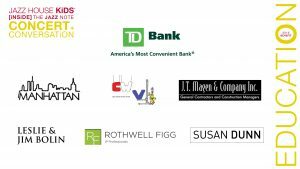 TD Bank returned as Inside the Jazz Note Education Fund Chair, with Co-Chair Manhattan Mechanical Contractors and Cool Wind Ventilation Corp. Many thanks to all of our individual and corporate supporters for making this special evening a complete success! New this year, the Inside the Jazz Note program expanded to include a full day of action-packed interactive masterclasses for hundreds of high school and college band and choral students with their instructors from across New Jersey, held on Wednesday, May 18 at the John J. Cali School of Music in Montclair State University. Led by Jazz House Kids teaching artists with host Christian McBride, this year’s special guests were Chris Potter and Ron Blake, considered two of today’s leading saxophone voices, as well as trumpeter Freddie Hendrix and pianist Shamie Royston. From 9:00am to 4:00pm, 200 students from 7 school bands (some as far away as Camden!) and our 3 big bands participated in one-on-one clinic time, masterclasses on improvisation, and performances by McBride and guest artists.